NAISBITT-BAGLEY TEAM SELLER NEWSLETTER UPDATE FALL 2014! HAPPY THANKSGIVING! Have you ever heard the advice, “Homes don’t sell in fall and winter–wait until spring!” I want to tell you I am so glad that no one ever told me that in 1984 when I first started my real estate career! Luckily, I continued working hard when fall hit and got my picture in the paper for being the top seller by the end of November! I learned that buyers who brave the cold weather are serious, and I never listened to the above advice when I started hearing it! Fall and winter are not seasons that typically attract lookers. Why would anyone come out in the cold during the holidays unless they needed a home or property now? It is true that there aren’t as many buyers in the fall and winter, but it is also true that there are lots more homes competing for buyers in the spring and summer. Fall and winter are great times to sell your home when the inventory is lower and the buyers need a home or property in my opinion! I have already heard the yearly question, “Should I take my home off the market for the holidays?” What? I would say just two words, “No way!” Why? Buyers purchase homes approximately 90% on emotion according to my training. What season provides more joyful feelings of love than Thanksgiving and Christmas? Our hearts turn toward home for the holidays and with good reason–memories of excitement, anticipation, happiness, family, and more! Holiday decorations invite those warm fuzzy emotions in your home. Showing your home to potential buyers at this wonderful time of year could certainly prove to be a blessing that may include finding the right buyer! Have you WINTERIZED everything that needs winterizing? We have had some freezing temperatures mixed in here and there with our warm fall days this year. Frozen pipes are no fun! 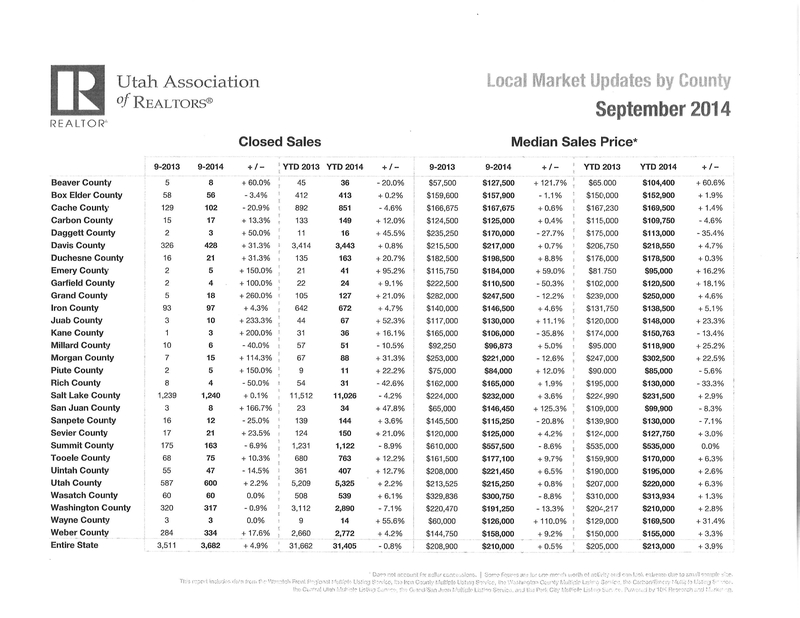 The latest Utah Association of REALTORS (UAR) updates for all counties are attached. It takes UAR approximately 2 to 3 months to compile these statistics for every county, so September is the current monthly report. Iron County closed sales are up 4.7% year to date (YTD) as compared to this time last year. Iron County median price is up to $138,500 which is up 5.1% YTD as compared to 2013. 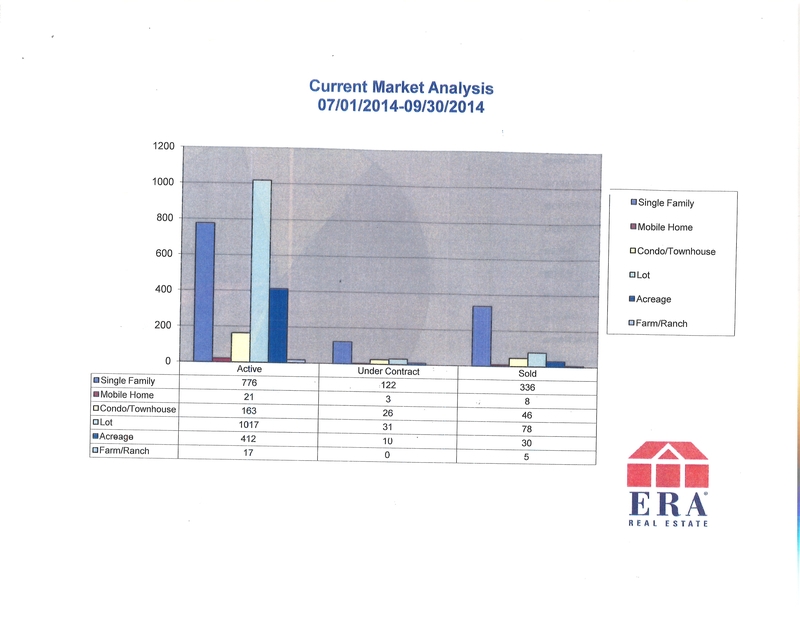 Inventory is down in our median price range in Iron County, or there would be more sales in my opinion! According to the Iron County MLS statistics, more homes sell in our area under $200,000. Be assured, however, that homes are selling in all price ranges when priced with the market. If your home or property has not been shown in 30 days, then please call our Team for a valuation to see if a market reduction in price is needed to attract your buyer! Acreage and lots are selling, but lot and acreage prices remain at bargain levels. Commercial and development properties are not attracting many buyers. We have investors and 2nd home buyers purchasing homes, but the majority of buyers seem to be looking for their dream home! New construction is an option that is currently available for home buyers. Outstanding marketing worldwide is an absolute must! You’ve got it with us! Exposure! Exposure! Exposure! Price it right if you want to sell it! Price it high if you want to keep it! It is like buying a new car! If it’s less on a different lot, it is human nature to go for the best deal. Fix it up and put the best foot forward! New paint! New carpet! Light and space! Make your real estate show like it is going to be on a video because it is–all over the world online! Let it be shown when the buyer wants to see it! Getting the buyer to work on your timetable may lose your buyer! It is difficult to conduct a home tour with one home out of order. The Naisbitt-Bagley Team wishes you a very Happy Thanksgiving! We are hoping we can all enjoy our gratitude attitude throughout the holidays and throughout 2015! A Harvard study teaches us that money does not bring happiness but that happiness does bring success! Let’s go for it and “enjoy where we are while we are there!” (That is one of Janet’s favorite sayings, so we thought it would be fun to share it! )” Looking at the bright side makes more happiness, less depression, and better relationships according to what I heard on TV, so it must be true! What a great holiday for all of us to practice being positive and thankful for our many blessings! Last but most certainly not least, I have extremely exciting news that I am thrilled to share with you! Our very own MATHEW BAGLEY just received THE REALTOR OF THE YEAR AWARD from the Iron County Board of REALTORS!” This is an incredible honor! It means that not only is he one of the top producers in our area, but also that his peers recognize his experience, integrity, knowledge, ability and service as a credit to the real estate industry! CONGRATULATIONS MATT! There is more! I am happily not finished with the congratulations that are in order today! ERA Realty Center’s broker, HEATHER ROUNDY, was just honored with THE BROKER OF THE YEAR AWARD by the Board of REALTORS! CONGRATULATIONS TO HEATHER! We feel honored to be part of ERA Realty Center and part of the professional group of real estate agents in our Iron County Board of REALTORS. Please call for your free real estate consultation: The Naisbitt-Bagley Team, 435-865-1019 at ERA Realty Center including Matt Bagley, Jennifer Corral and me, Janet Naisbitt-Bagley. We work hard to make your realty dreams a reality! You can also email naisbitt@inxsnet.com or text me at 435-559-7772, Matt at 435-590-8788 and Jennifer Corral at 435-559-0366. Fall is here and the leaves are beautiful. Experiencing our 4 seasons in Cedar City and surrounding areas brings joy to the heart! However, if you haven’t WINTERIZED yet, now is the time! Freezing temperatures switching back and forth between sunshine and warmth! Avoid those terrible frozen pipes! With the coming of fall, the excitement arrives for the holidays! Some think they should take their homes off the market! On the contrary, your home is very warm and inviting with decorations. Buyers purchase 90% on emotion according to statistics, and decorations often bring back warm feelings and love. Another positive for holiday showings, is that buyers this time of year are typically serious. They need to buy now! Buyers who don’t need to buy right away will most likely put of their home and land shopping until better weather and less busy schedules. 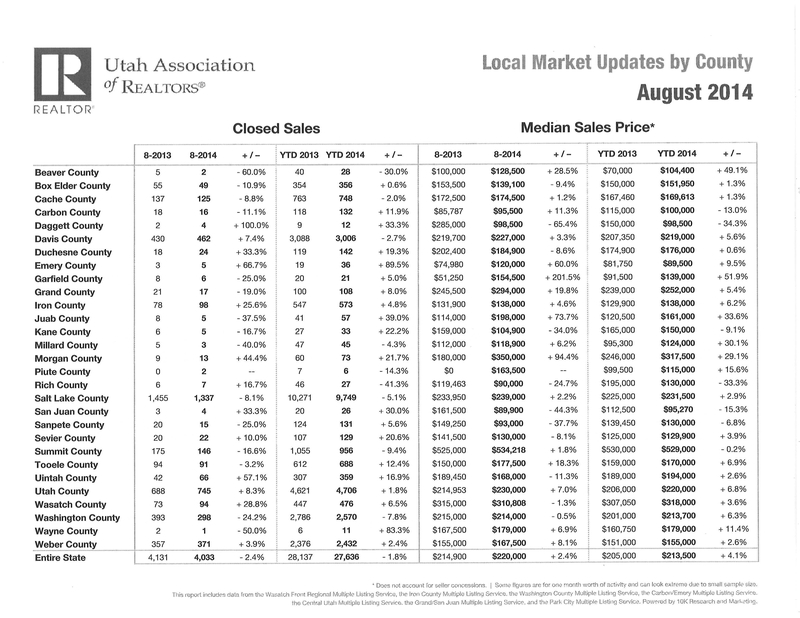 The Utah Association of REALTORS (UAR) county updates are completed and attached for August 2014! As I mentioned, it takes UAR approximately 2 or 3 months to compile the statistics for every county from the Multiple Listing Services (MLS), so these are the latest statistics available for you. Interest rates are still low and buyers can purchase often with a payment of less than rent. Multiple offers often come in on properties priced for the market. Most homes sell below $200,000 but homes are selling in all price ranges when priced for the market. We are seeing buyers looking for primary residences as well as investment properties. Buyers are moving up and down and out of town and in town. Many buyers come from out of state. Commercial, land, lots are still slow movers and often discount prices to sell. Good news: According to the report, August closed sales in 2014 were 25.6% better than 2013. 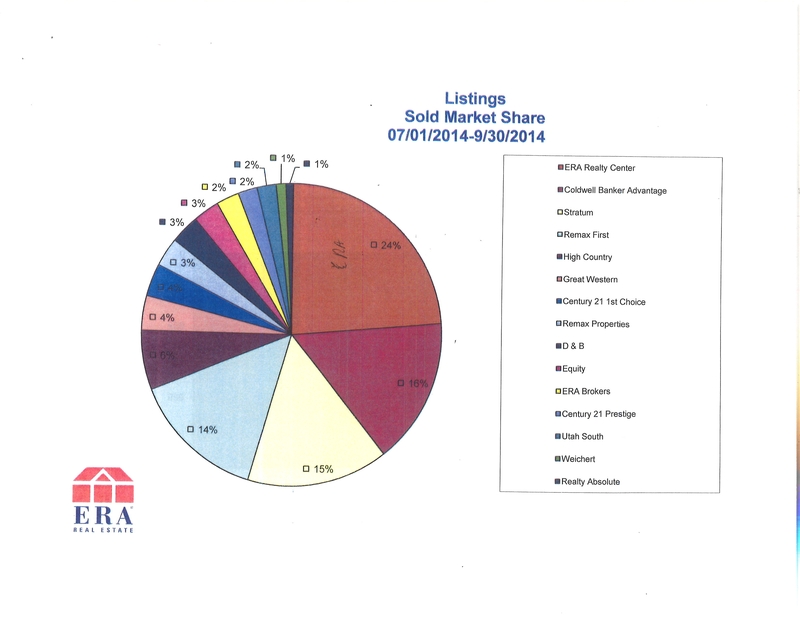 Closed sales year to date (YTD) 2014 were up 4.8% as compared to 2013. Median sales price YTD is $138,000 which is up 6.2%. Sometimes the seller can fix a “minor thing” “like a missing stairway hand rail, or faulty GFCI receptacle” that may not cost much but could save a life later on. When the seller fills out his required “Seller’s Disclosures,” it is nice to list the item as fixed rather than not working. The buyers often want the price of the home discounted much more than it would cost for the seller to fix the item ahead of time. This can be as important as cleaning, painting and new flooring which are top priorities in preparing a home for sale. We are sad that CML Mines has announced that it is suspending its production. According to Cedar City Daily News, “While company officials were not able to give out the exact number of employees, Dale Gilbert, president and CEO of CML Metals, said the layoffs will affect more than 100 people. We hope the future holds a reversal of that decision! Pricing can affect the value of marketing. If the price isn’t right, the ad doesn’t attract a showing, so please contact us today for your free consultation on pricing, staging or any other concerns or questions you want to discuss! Please let us know if there is anything else you want us to do to help you reach your goals. Call 435-865-1019 or email naisbitt@inxsnet.com. You can also text our Naisbitt-Bagley Team: Matt 435-590-8788; Jennifer C. 435-559-0366; Janet 435-559-7772 for top service. We want to help your realty dreams become a reality! We care.